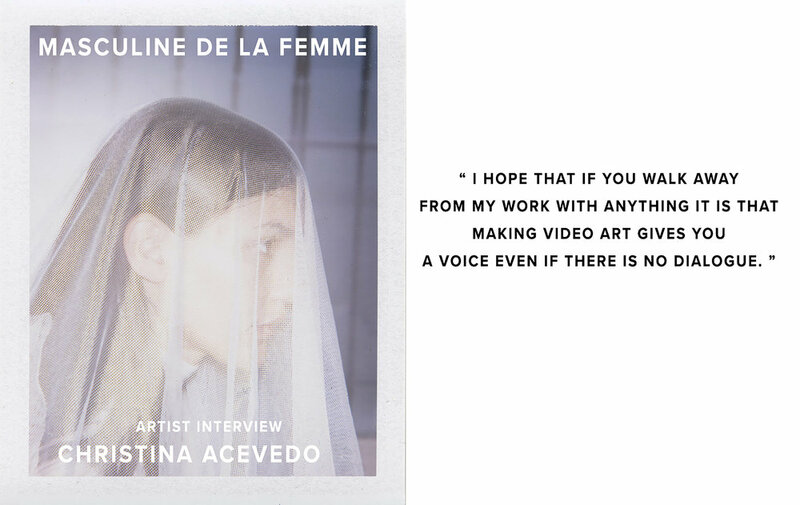 Christina Acevedo Interview "Heaven Scent"
We met Christina Acevedo at the Printed Matter LA Art Book Fair in February 2017. We had just published and released our first Masculine de La FEMME Zine Volume # 1 with a press called Cash Machine. She had been walking through the book fair and arrived at the same aisle where we were showing. We immediately were struck by her ethereal presence, beauty, and timeless style. We exchanged a few words and she mentioned she makes films. We looked up her work [see here] and felt that her short films and aesthetic spoke directly to us. A few weeks passed, and we saw her again at Smoke Break at Club Pro in downtown LA. We chatted some more and asked her to sit in for our portrait artist series. MDLF : If you could describe yourself in one word, what would it be? MDLF : Is there a specific artist that inspires you? Dead or alive. And why? Has this person influenced the way you apply yourself in art? CA : Bill Viola. He is an important artist to me because my mom took me to see his work when I was 5 years old. You are instantly sucked into his work when you step into the video installations. His work is important to me because I have learned to slow down and look between the lines of my video art and find the really beautiful natural moments that I haven't even planned for - those natural to human movement and reaction. I have also felt so many heavy emotions while watching his work. The use of themes like time and self reflection in Bill Viola's work has impacted how I make work today. If you have not seen his work and want to be moved to the core I urge you to find where he has some installations up and check out his work. MDLF : What is something you’ve never done before, but have always wanted to try, and probably plan on trying? CA : To go camping in Iceland... or to build a home in a shipping container. MDLF : How do you balance your everyday life and doing the work as an artist? CA : I don't think about it too much. I just jump in. Working freelance makes it hard to balance paying work vs. art making so I kind of just have to jump in when I am feeling inspired. I have started painting, I make music, edit and write ideas for video art so sometimes I am doing all of those things in one art making session... it's kind of frantic but works for me. MDLF : What are any current social or political issues that concern you and what would you do with your art to affect that issue? CA : Planned parenthood funding /// creating safe places for women //// abortion //// surveillance /// gun control. I don't know if it is intentional but I do not see how these issues couldn't be impacting my work on a subconscious level. I hope that if you walk away from my work with anything it is that making video art gives you a voice even if there is no dialogue. I also hope to inspire other young women out there to just make films. It is possible despite the fact that you don't see many female filmmakers in the spot light. But by embarking on video making yourself you will meet other females making films out there and it can be a really rewarding and empowering experience. You are also bound to learn about many female video artists who have paved the way for styles of experimental filmmaking. MDLF : When and why did you choose art? CA : I don't know if I chose art. It is a safe and positive space for me to be in within my own mind. I grew up around a lot of classical music, going to Opera, and art galleries. It has always been a part of my life. I have been making movies since I was in the 4th grade. I started working with metal when I was a freshman in high school for four years... I just never thought I could earn a living or be taken seriously as an artist. So I would say it wasn't until sophomore year in college when I was working with New York Women in Film and Television (new yorkers this is a great organization - look them up) that I realized I - a young woman - could have a place in the film world. MDLF : What was something you feel you truly worked very hard to achieve? CA : Producing and directing my first short film with a 20 person crew. MDLF : What was your first job? CA : Out of college working as a PA on the set of Sherlock Holmes. (But my FIRST JOB EVER was working at a Bakery in 8th grade). MDLF : When is a piece finished? This question is so hard! I feel like some pieces I work on for way too long. Some pieces like music or painting are finished right away... I rarely go back and make changes. I think it depends on the project and collaborators. CA : The greatest things in life - what brings you joy?